STEAMBOAT SPRINGS — For the third time this year, wildlife officers have euthanized a black bear that had become a nuisance in Steamboat Springs. 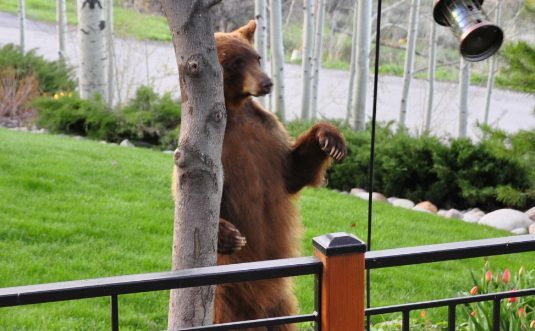 The bear was trapped Sunday night on Clubhouse Drive. The trap was set because a bear had been breaking into garages, ripping apart freezers and getting into food. “We’ve had multiple reports of property damage over the past week,” Colorado Parks and Wildlife Area Wildlife Manager Kris Middledorf said. In one case, a bear tore apart an entry door to get into a garage. There have also been numerous reports of bears getting into cars. The bear trapped Sunday night joins 50 other bears that have been euthanized by Parks and Wildlife officers this year in the nine-county Northwest Colorado region. Another 36 bears have been relocated. Parks and Wildlife spokesman Mike Porras said the heaviest bear activity has been in Pitkin, Eagle, Mesa and Garfield counties. Middledorf said bears can be euthanized if they cause property damage, are a threat to human safety or if the bear has been a nuisance on two or more occasions. Parks and Wildlife has been moving away from relocating trapped bears because they have a tendency to get into trouble again. “Where in Colorado can that animal go and not get into trouble?” Middledorf said. Winter is approaching, but bears have not started hibernation yet. “I would expect them to be around for the next 30 days at a minimum,” Middledorf said. He said most of the natural food that bears eat, such has berries, has already died off or been eaten, and as a result, bears are likely to be roaming around town looking for food.